(APN) ATLANTA — The cityhood efforts that would incorporate the proposed City of South DeKalb and City of Stonecrest, both in unincorporated DeKalb County, took huge steps forward recently. The groups submitted their signed proposed maps November 17, 2014 to the office of State Rep. Amy Carter (R-Valdosta), Chair of the Georgia State House Governmental Affairs Committee. They had previously submitted their maps to State Rep. Mike Jacobs (R-Brookhaven) on October 16, 2014. “If approved, the city of South DeKalb will represent a historic step in DeKalb county’s history. The population of South DeKalb (294,398) will render it the second largest city in the state of Georgia. If South DeKalb is approved along with Stonecrest (population of approximately 50,000) and the… cities in the north, it would essentially mark the municipalization of DeKalb County,” the Concerned Citizens for Cityhood in South DeKalb (CCCSD) said in a press release. At this time, there are two groups seeking cityhood in north DeKalb, as previously reported by Atlanta Progressive News: LaVista Hills and Tucker. LaVista Hills is the union of the former Briarcliff and Lakeside efforts from the 2014 legislative session. In addition, there are annexation efforts, including the City of Atlanta’s attempted annexation of Druid Hills and Brookhaven’s attempted annexation of Executive Park. Dr. Kathryn Rice of CCCSD has been writing about municipal incorporations for a few years. A published writer in the field and South DeKalb resident, her reasons for incorporating South DeKalb to form its own city were simple: strategic and financial. “I’ve been writing on municipal incorporations in academia. I am very familiar with this arena, across the United States. Sandy Springs cityhood is what started my interest in the subject. I’m not pro-incorporation, but I began to see that some of the cities that were annexing properties were either in or close to South DeKalb. That’s when I paid attention,” Rice told APN. “South DeKalb compared to North is underdeveloped. By far, the development is on the north side. The result is there will be less to incorporate. Incorporating should never be a defensive. You should always do something so there is benefit to all. The way the county is structured right now, it is not beneficial to the south side,” Rice said. “By partitioning itself, South DeKalb has a shot at the benefits [that North DeKalb has]; we can begin to draw economic development into South DeKalb. This is the primary reason for incorporating. 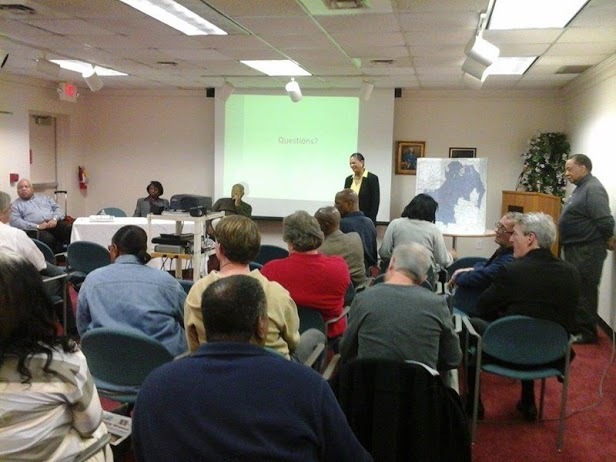 When these annexations [in the North] occur, they are taking the few assets that South DeKalb had,” Rice said. “We want to protect ourselves financially,” Rice stated as the second reason for incorporating. “There is a 50 million dollar annual pension payment that South DeKalb would have to bear the brunt of, if we remained unincorporated, while the rest of the County incorporated. Right now, each person in South DeKalb is paying 91 dollars. If South DeKalb was responsible for that payment after North DeKalb incorporated, that number would increase to about 141 dollars per person, approximately 56.4 percent. I am working on what the burden would mean to the medium income, four-person family,” she said. Oddly enough, when APN asked each cityhood effort what the reasons were for incorporating, the sentiment was a distaste for County Government and a general lack of trust for County officials. Pension funding is not a new issue in Metro Atlanta, with the City of Atlanta having recently amended its pension plan for new employees, while requiring existing employees to increase their contributions. Whether or not paying for DeKalb’s annual pension obligation was an an issue for the Northside efforts is unknown. Many of the new cities in Fulton County that have incorporated over the last ten years have privatized most city services, leading to less pension obligations, and less retirement security for city employees. Rice’s research shows that municipalization is not just a local trend; however, Metro Atlanta is leading the country by far. Rice found a few prevailing commonalities from areas around the country that have sought incorporation: well-educated residents with higher incomes; as well as concerns regarding quality of life issues, control over zoning, control over growth, and a consolidation of wealth. The predominant race among communities that incorporates is White. While Georgia leads the way in cityhood and annexation efforts, parts of Texas and Missouri, as well as California, are also in the game. Rice also told APN that a feasibility study has been initiated with the University of Georgia Carl Vinson Institute. The question of ‘Will the area generate enough revenue?” is the main question of the study. “I’m more concerned with the sprawling nature of this city and especially encroaching ITP north of I-20 where disputes with Atlanta, Decatur, and Avondale Estates will easily occur… I’d be anxious to see the moods of the people inside the proposed boundaries and how this would fix the school system,” Brian Walker, a Facebook member who showed interest in CCCSD’s efforts, said. Developing an internal structure, determining final boundaries, and an outreach tour are CCCSD’s priorities that will carry the group into next year’s legislative session. At this time, there is no legislation drawn up for South DeKalb. State Rep. Rahn Mayo (D-Decatur) sponsored the feasibility study, but has not introduced any legislation. The results of the feasibility study are due December 2014. The CCCSD main rational is economic development, avoiding higher taxes and protecting assets. How is the CCCSD defining economic development, is it tax reduction? How will it achieve the economic development that it is portraying in their vision? The elephant in the room that some people want to ignore is that business investments tend not to be significant in areas that have a population of color over 65 percent. New municipalities can impact taxes, school districts, land-use, growth control, environmental regulations, elected representation and public utility services. New municipalities can lead to fragmentation and competition for financial resources between local governments. Why does the Greenhaven sky line logo look like the New York sky line. The new city of South DeKalb want ever look like New. However came up with that logo is hallucinating or psychotic. The logos for Dunwoody, Brookhaven and the other cities are more realistic. We are a suburb of Atlanta. We live here in unincorporated DeKalb because we do not want to be in an urban center. There are disputes over which neighborhoods should be included in the boundaries with Decatur, Lithonia and Stonecrest and other communities. There should be a timeout in order to keep this frenzy from becoming a nightmare for everyone. The Communities and Neighborhoods do not have opportunities to opt in or out of any of the boundaries of the proposed cities. We are being told we only have the ability to say Yes or No at the end of process during the referendum. This does not make any sense. We should have some say so in the front end of the process, to rather communities are included in the new city boundaries. What if where you lived this was done to you. A group of people that have not been elected by anyone drafts up a city proposal ,creates a boundary map, and creates a charter and then ask the state to sanction it. You would be outraged, like I am. costs, and the report did not consider the impact of the new city impact on the DeKalb County as a government. The report does not validate the necessity or efficacy of forming a new city. The report did not consider the views of the residents of the affected area. According to the county budget department, the new cities are contributing to the county pension plan, though not to the same extent as if they had not become a city. The typical portion that new cities may not be equally contributing to are police and designated services if new cities are providing their own services in those areas. All the other county funds contribute to the pension. Repeat it enough times they will believe it and then it will become fact. Even the political leaders at the state and county government levels are repeating the facts incorrectly. Kathryn Rice back tracks on her statement that South DeKalb will be left paying pension. First, Rice and her group said there was a law that permitted the new cities to avoid paying or sharing in the cost of DeKalb pension plan; almost everyone was repeating it, even State lawmakers and DeKalb commissioners. Now Kathryn Rice and her group admits there is no law. They now use the words “fair”, “shoulder” and “burden” of the pension costs, a play on words. The group Concerned Citizens for Cityhood in South DeKalb has repeated so many times that “South DeKalb would be the only area paying the pension” that everyone believes what they have been saying is true. The factoid meter indicates that this is not true, and that the statement is a stretch of the facts. It is being used as a fear or scare tactic to get residents to support cityhood. Rice continues to say if the city of South DeKalb is created that it is her position that the city should make pension payments. It seems that there is some double talk going on. Cityhood does not mean economic development or growth, if so, all the cities close to the Hartfield-Jackson Atlanta International airport would be booming. Residents should say no to more government, crime and corruption. The school problems need to be dealt with by the school board, the crime in South DeKalb needs to be addressed, and the residents need to get more involved in their communities and schools. Big businesses and good jobs will not stay or come in an environment where there is high crime and bad schools, unless these problems are addressed. Yes, we need to do something, but we do not want to make our situation worse. It is the job of the chamber of commerce and private citizens to create jobs. The government can help create a business friendly environment. However, if the government becomes the primary business then we will look like Cuba or North Korea. Some of the proponents of cityhood should be running for a position in the chamber of commerce, not in government. Alternatives have not been presented to residents in the affected area. For example, smaller cities, opting out of the city, change the annexation laws, court action. Alternative forms of quasi-cities should be considered, private residential associations or communities and special districts could also be alternatives to cityhood.